FLEXISEAL is a split seal developed for use where continuous seals cannot be used - where the presence of flanges or abutments prevent fitting a continuous seal along the shaft, or where the cost of stripping down the plant to enable a continuous seal to be fitted is prohibitive. FLEXISEAL is available in split and endless types; Fabric/Rubber, Rubber only, Viton, and most other available materials. 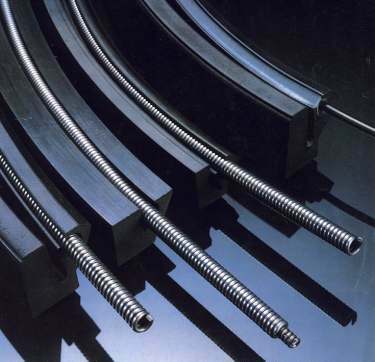 As well as SEALMASTERS own FLEXISEAL, with its renowned SpringGuard feature, other makes are stocked, such as: James Walker, Carco, Garlock etc..
FLEXISEALs are available in sizes up to 50 Inches in diameter.